The title of this book contains a hint of its running theme; which is more of a plea really. The author's appeal is for unity within America, and he hopes that the desired unity can be established once again through the symbols and icons deployed by the founding fathers. It's not a particularly extraordinary things to hear Americans calling for, to be honest. From an outsider's point of view, American patriotism is, frankly, overdone already. Calling for more patriotism is bordering on jingoistic. But Robert Hieronimus sets out a solid reason for revisiting the symbols of American pride. He claims the need to debunk the various ludicrous assertions of conspiracy theorists, who have derided the iconography of the republic as un-Christian, even satanic. Their interjections threaten the soul of America, Hieronimus asserts. I'll be honest. I don't think these theories warrant the time of day, let alone 268 pages of analysis. Hieronimus raises his sword and shield to defend America from a stream of conspiratorial nonsense. In doing so, he runs the risk of giving these crank authors an air of legitimacy. Nevertheless, Hieronimus seems convinced that an able defence is needed. If correct, the implications of this are scary indeed. What on earth has happened to America to find itself in such a position? Are there Americans out there who seriously think that their own founding fathers were practising Satanists, embroiled in a secret Bavarian cult? Let us, for a moment at least, assume there really is a case to answer. Conspiracy theorists interested in the Illuminati and the Freemasons have found a wealth of connections between the icons of these organisations, and neo-classical symbolism deployed by the early American republicans. So what? The United States and Freemasonry both emerged in the 18th Century, and many of the founding fathers of the republic were Freemasons. So what? As Hieronimus points out, they were also all Christians, yet had the foresight to separate Church and State. Compare with the British monarchical arrangement, which continues to stand in the place of any kind of formal constitution in the UK. There has been no disestablishment between Church and State here. Yet, ironically, modern Britain is a truly secular country. Compare and contrast with the highly religious nature of modern public life in the constitutionally secular USA. The irony is telling. Consequently, if there was an early Satanic Illuminati plot to undermine Christian values in American society, it has evidently failed, in spades! Having rejected the basic tenet of the book early on, I did find its actual historical content fascinating. It's well researched, and well written. I have read David Ovason's book on the symbolism of Washington DC, which was clearly a major influence on 'The United Symbolism of America'. That's no bad thing, because Ovason's work is of a very good quality. Both authors consider symbolism in its wider historical context, and weigh up the pros and cons before immediately jumping to conclusions. The section of this book dealing with the layout of the streets of Washington DC was of particular interest to me. Hieronimus highlighted the various spurious assertions that have been made about hidden symbols to be found in the geometrical layout of the federal city. He then debunked them. He was right to. Important roads were certainly laid out with archeo-astronomy connections in mind, in Washington DC, as in Europe. But these symbols were not Satanic. Let me give you an example of how I could produce a thumping great conspiracy theory based on a quite innocent design. I was navigating through London by car recently, and spotted a pentagram in my London A-Z. Well, it's not quite a pentagram, but it's close (see image right). Yes, folks. It's as clear as day! 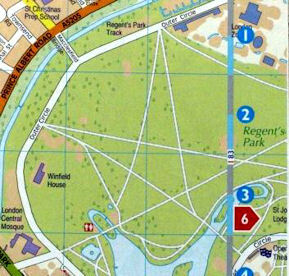 The designers of Regents Park were evidently Satanists... And what's this? The broken point of the pentagram to the bottom left points to...London Central Mosque! So, perhaps the early designers of the park anticipated the future construction of an Islamic place of worship, and did an early Salman Rushdie. Or, alternatively, planning permission for the Mosque was provided by a Freemason with a sense of humour! You see how easy this is? You can make these patterns mean anything you want. In reality, the Regents Park pentagram is simply a function of the park topography, and its broken apex conditional upon the position of the lake. The Mosque has as much to do with it as London Zoo. I would have been a lot more comfortable with 'The United Symbolism of America' if it had not given such a serious platform to the nutters. As an historical tract it is informative, and an enjoyable read. I learned a lot about early American history, and about the American perspective of that history. I also felt comfortable with Hieronimus' liberal viewpoints. He was brave to highlight the feminine nature of many of America's strongest symbols, given the robust way that feminism has been pushed back in post 9-11 America. Sincerely, I hope that his softer form of Patriotism comes back into fashion in his country in the years ahead. That would be something worth uniting behind. 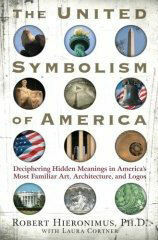 Subtitled "Deciphering Hidden Meanings in America's Most Familiar Art, Architecture, and Logos"